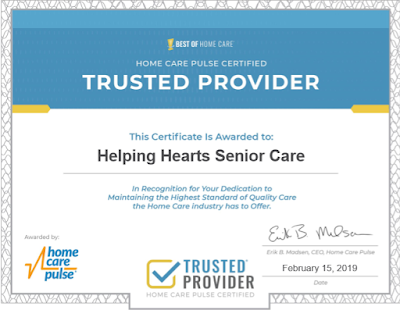 Helping Hearts Senior Care is proud to announce that we are now a Home Care Pulse Certified – Trusted Provider. Home Care Pulse is the industry’s leading firm in satisfaction research and quality assurance. They help agencies measure the satisfaction of their clients and caregivers. To earn this award you must be committed to providing excellent quality in your home care services. At Helping Hearts we care about quality and are committed to providing quality care.